Upon approaching the Tohu Theatre last night, and despite having been informed of brisk ticket sales, one couldn’t help being surprised to learn there was not a single parking spot to be found anywhere on the property, the orange-vested attendants of the seemingly vast lot next to the theatre reduced to shaking their heads and directing people to the Canadian Tire half a mile away. Having attended almost every fight card staged at the Tohu the last few years, never had your humble scribe faced this particular dilemma. John “Kinsha” Dangako decisioned Patrick Lafleur. But the simple fact is that last night’s show was a complete sell-out. Every seat was spoken for and a boisterous crowd greeted the commencement of the scheduled bouts, though the opening bell was missed by your faithful correspondent as it took him some time to figure out where to leave his vehicle and then secure assurances that, while it was in fact illegally parked, it was unlikely to be towed away. Ten matches were scheduled and right from the start the dominant theme of the entire show was made evident to all: fast-paced and punishing action. As it turned out, almost every pugilist on the card bravely risked personal welfare in a bid to give the stoked-up crowd their money’s worth, as one bruising slugfest followed another. The success of a boxing card can be measured a few different ways, but in the end it comes down to two things: occupied seats and entertaining fights; in both regards, last night’s show was truly impressive. 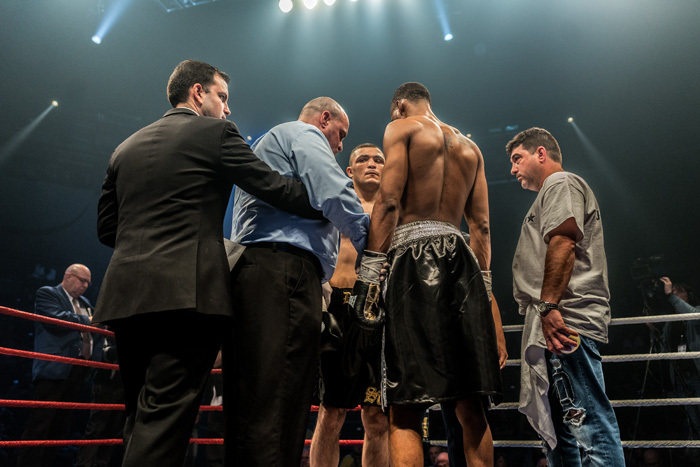 Adam “Danger” Ayoubi and Alex Ebanks receive their pre-fight instructions. Which might have come as a surprise to the more jaded of Montreal boxing fans when the line-up for this show was first announced. After all, neither of Rixa’s two top thoroughbreds, Erik Bazinyan and Francis Lafreniere, were on the bill. Bazinyan has jumped ship and abandoned the outfit which had made the auspicious start of his pro career possible, while Lafreniere recently head-lined a card at the Montreal Casino. But with the date at the Tohu booked, the hard-working people at Rixa (namely, Maxime Fortin), had to try and put something of substance together. Ayoubi gets home a wild right hand. 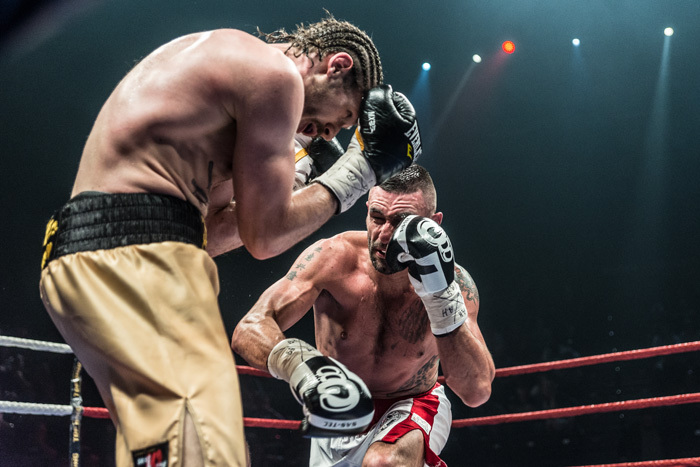 That they did, and in the process bolstered a hypothesis this lowly scribe has been advancing for some time, both privately and publicly, namely that the lively fight scene in Montreal possesses enough talent to start giving its fans meaningful cross-town match-ups, that it was past time talented Montreal boxers met fellow talented Montreal boxers in clashes certain to inspire more attention, excitement and ticket sales. Bruno Bredicean tags Eliud Rocha. And so it came to be last night with at least four bouts that could qualify as legit Quebec “turf wars” and two others which saw rivals from different provinces throw down. And of the other four matches which saw foreign opponents flown in, all were anything but easy fights for their respective opponents as the visiting warriors earned the plaudits of the crowd for their brave efforts. There may not have been a big name draw at the top of the marquee for this particular show, but we didn’t need one and it wasn’t missed. Instead we got plenty of action and excitement and a boisterous atmosphere generated by different factions of fans, as several of the local fighters came with sizable followings in tow. 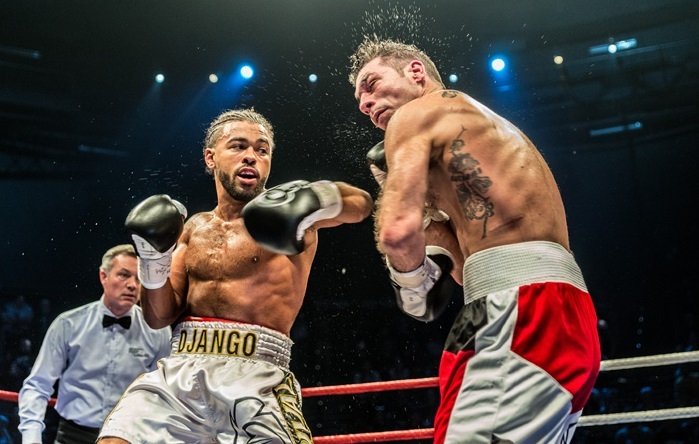 First up was the pro debut of Montreal’s John Dangako who repelled a spirited effort from one Patrick Lafleur (1-2-1). These two super lightweights set the tone for the entire card with a four round scorcher that had fans on their feet and cheering. Not much separated the two warriors but Dangako appeared to do the cleaner work and land the sharper punches and the judges rewarded him accordingly. 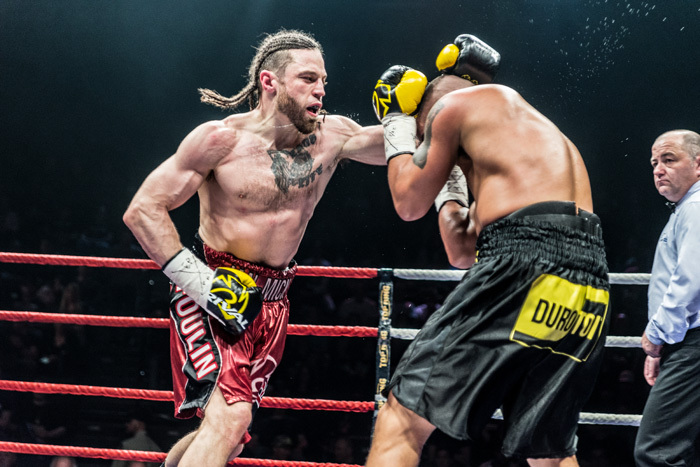 Another local pro debut was next with middleweight Adam “Danger” Ayoubi coming up short and settling for a draw against Toronto’s Alex Ebanks (1-3-1). 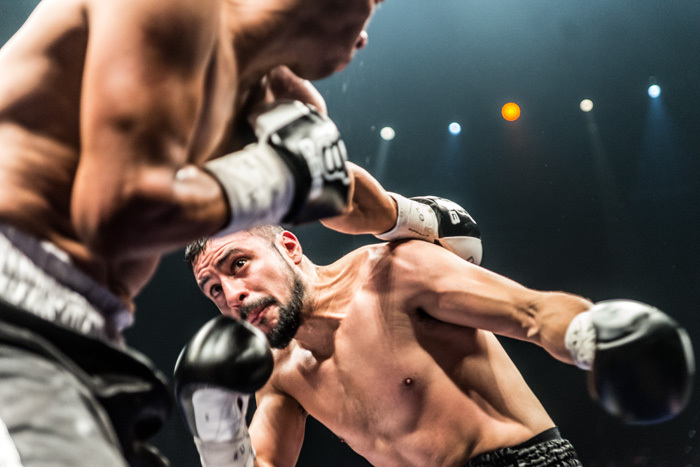 In truth, Ayoubi was fortunate to not take a loss in his first pro fight as Ebanks, between dodging Ayoubi’s wild swings, appeared to get home more scoring blows. Parente with a rare clean shot on Houle. Rising super welterweight prospect Bruno Bredicean showed poise and professionalism as he upped his record to 11-0 with a hard-earned though clear-cut decision victory over Mexico’s Eliud Rocha (14-10-2). 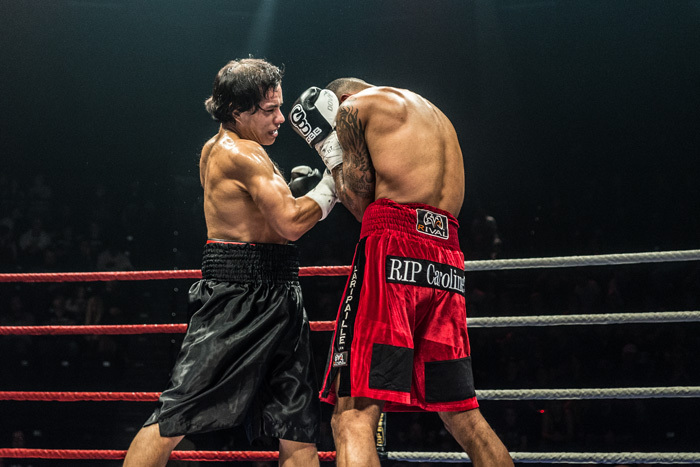 Dedicated body work and snappy combinations were Bruno’s tools of choice last night as he dominated most of the action and pocketed a six round unanimous decision. 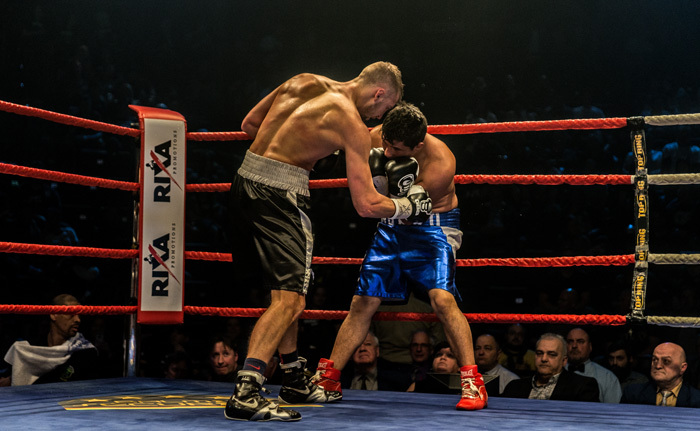 Bredicean’s skill and workmanship was sharply contrasted by the mess of a fight which followed as a second Quebec vs Ontario scrap went down between light heavyweights Marco Parente (1-2-2) of Woodstock, Ontario and local hero Tommy Houle. This was four rounds of mauling and clinching with few clean punches landing as the fighters lurched about the ring like a pair of drunk lovers at closing time. 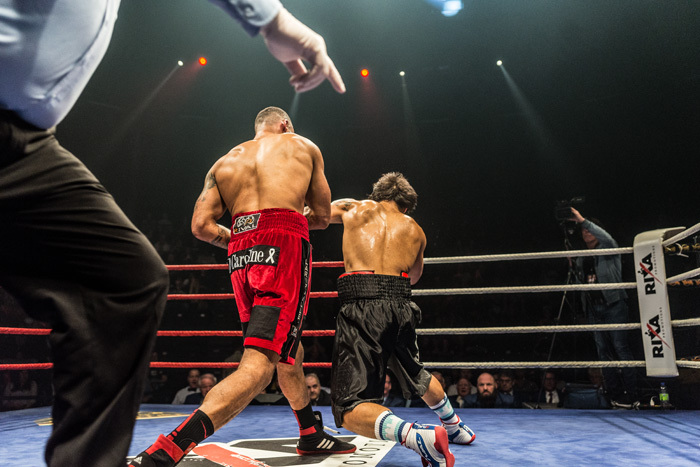 After several warnings, the referee deducted a point from Parente for excessive holding and the judges gave Houle his second pro win. 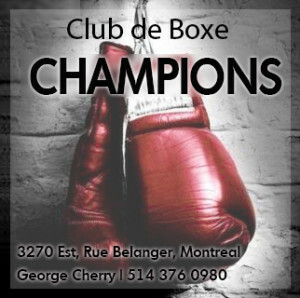 Next up, a genuine turf war between Montreal’s Samuel Vasquez (1-4) fighting out of the Grant Brothers Gym and Kevin Menoche (2-0) of nearby Repentigny representing Club de Boxe 35. The middleweights maintained the prevalent theme of high-octane action as from the opening bell the fighters spurned all pretense of warming up or feeling out the opponent and instead immediately squared off at ring center and unleashed volleys of wicked punches, Vasquez scoring to the body while the taller and longer Menoche slammed home jabs and right crosses upstairs on his shorter opponent. Vasquez goes toe-to-toe with Menoche. But it didn’t take long for a fast-paced battle to turn into a cruel beatdown as Vasquez demonstrated complete disregard for his own safety. He masochistically refrained from doing anything at all to avoid the heavy shots coming his way, his head bouncing around like a speed bag as Menoche teed off. 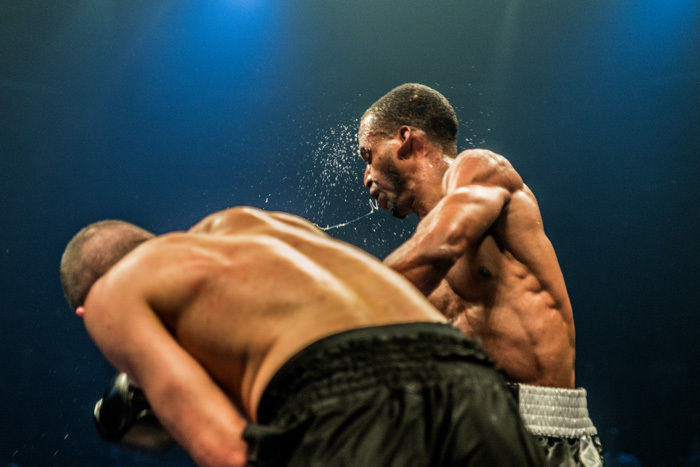 In round two Menoche sent his brave opponent to the canvas with a heavy right hand and when a stunned Vasquez beat the count he was rewarded with a volley of flush blows that put him down again, this time flat on his face. The referee immediately stopped the bout and all were relieved a few minutes later to see that Vasquez was okay as he had absorbed far too many clean shots in too short a time and was clearly concussed. Menoche sends Vasquez to the canvas. 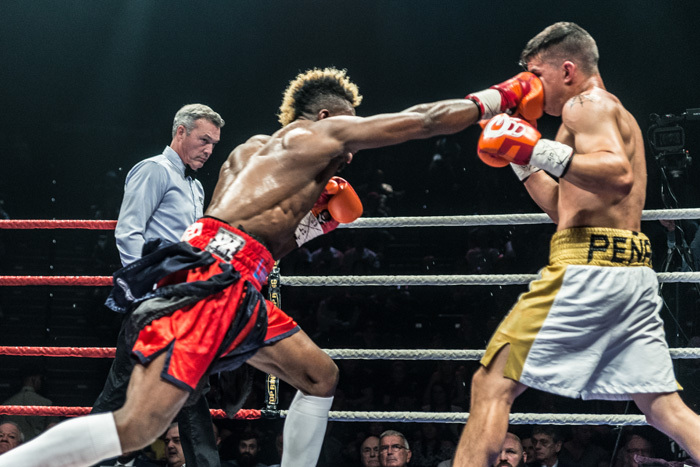 Next, it was Mohamed Soumaoro’s turn to bask in the spotlight as the undefeated lightweight faced the more experienced Javier Pena (11-11-1) in his fifth pro tilt. 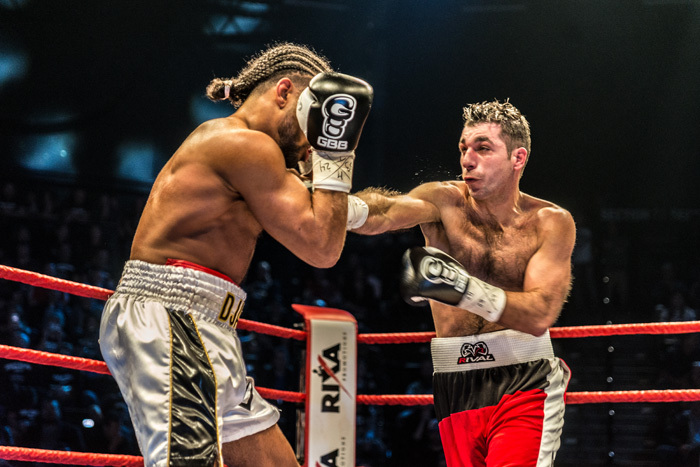 Soumaoro is clearly a gifted pugilist but his enthusiasm for preening and posturing got in the way of his boxing at times, as a match he might have otherwise dominated proved a competitive and entertaining battle. In addition to hamming it up for his fans, the Montreal fighter has a bad habit of landing a good shot and then waiting for something to happen instead of following up. Soumaoro with a hard right hand on Pena. Thus while “Mo Money” enjoyed clear advantages in terms of quickness and power, instead of fully exploiting them he spent lengthy intervals playing to the crowd and taunting Pena, who stayed focused and scored points with an admirable work-rate. Pena even won round four on our card, but Soumaoro closed the show in the sixth, lashing the Mexican with vicious shots. 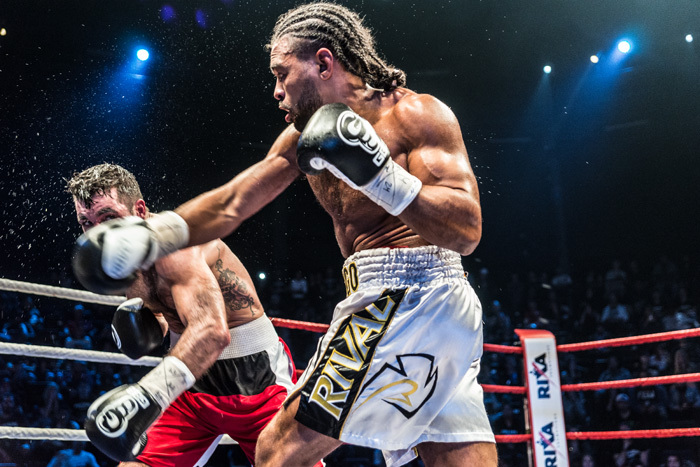 Pena remained unimpressed and fought back as best he could and the result was yet more high-voltage action for the fans before the judges awarded Soumaoro a unanimous decision. Now it was time for Montreal’s Golden Garcia to continue his winning ways as the lightweight contender upped his record to 11-0-1 with a stoppage of Mexico’s Adalberto Borquez (29-18-1). This was the most one-sided match of the night as Borquez lacked the strength or power to keep Garcia at bay and yet it was the Mexican who often fired first in the exchanges as Golden performed with inexplicable hesitancy. He picked up the pace in round four but Borquez showed astonishing toughness, soaking up the blows and fighting back. 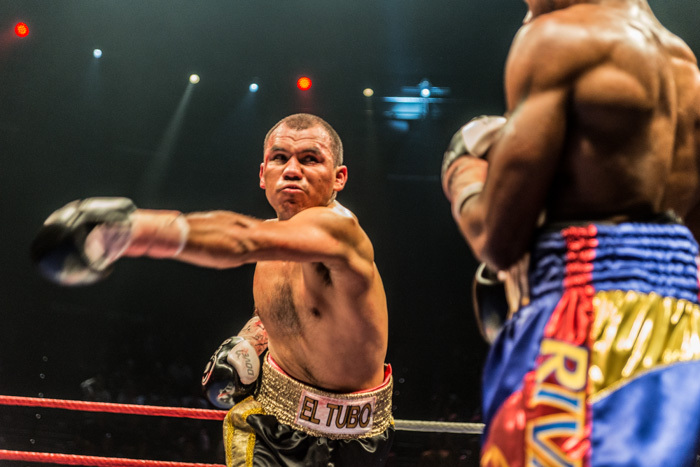 Finally, in round seven, Garcia further upped the intensity and his two-fisted attack sent Borquez careening about the ring before he hit the canvas and the referee ended what had devolved into a one-sided battering. Grant Brothers prospect Golden Garcia. 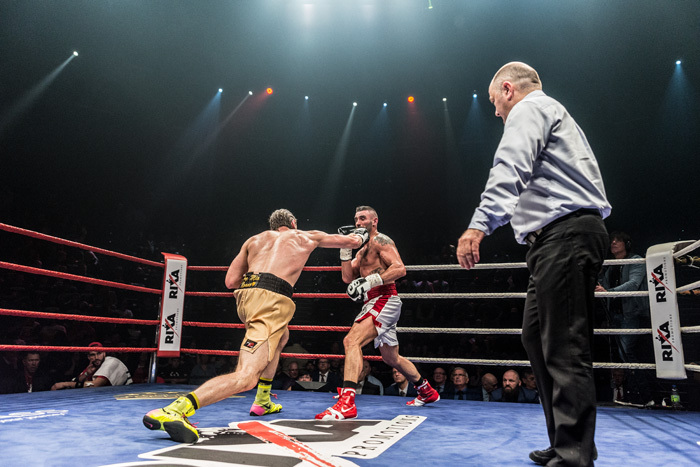 Another all-Quebec turf war followed Garcia’s victory as middleweights Jean Michel Bolivar of Pointe-Calumet and Jan Michael Poulin of Mascouche put on a terrific show. 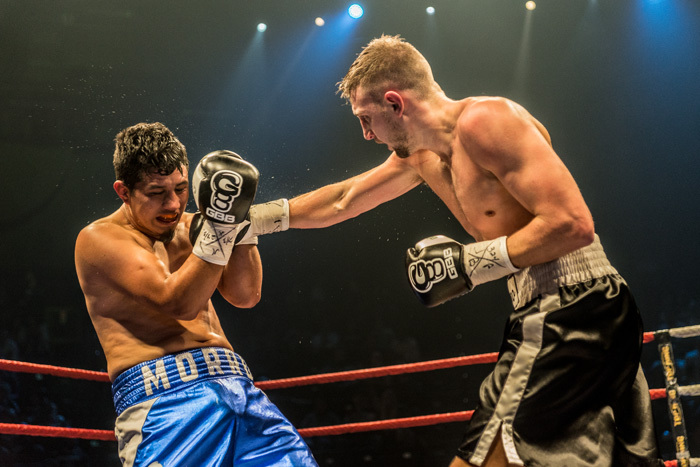 It was only four rounds between relative novices, but in just twelve minutes Poulin and Bolivar crammed in more action and excitement than many seasoned pros do in ten or twelve rounds. As rival groups of fans held cheering contests, the two warriors took turns blasting each other with their best shots, the action only intensifying as the battle went on. 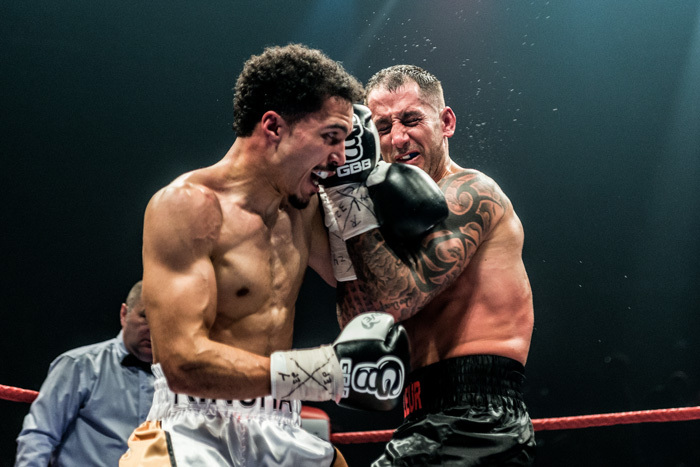 In the final round Poulin scored a knockdown, but Bolivar rose and actually stunned his rival twice with big shots before the final bell rang. 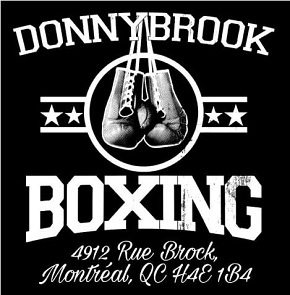 The decision went to Poulin, but I’m sure I’m not alone in thinking Montreal fight fans need to see Bolivar vs Poulin 2. Garcia celebrates a golden win. 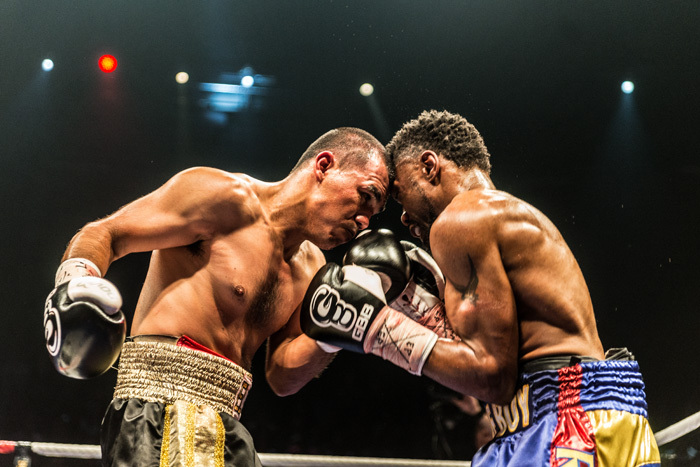 But one donnybrook followed another as lightweights Roody Pierre-Paul and Jesus Laguna then went to war for eight savage rounds in a grueling blood-and-guts battle. What exactly are the people at the Tohu Theatre putting in the water there, or giving the fighters in their dressing rooms? I ask because, once again, from the first moment of the match, Laguna and Pierre-Paul dispensed with any warming up interval and just started winging big shots at close quarters. It was fast-paced combat all the way and things only heated up in the second round when Laguna opened a nasty cut over Roody’s right eye. By rights, this fight should have been another that had the crowd on their feet and cheering incessantly, but the Montreal fans were so spoiled and now so accustomed to carnage, that they greeted the intense battle with an air of nonchalance. The Tohu was relatively quiet as Laguna and Roody blasted away at each other, the experienced Mexican striking with the more accurate punches. 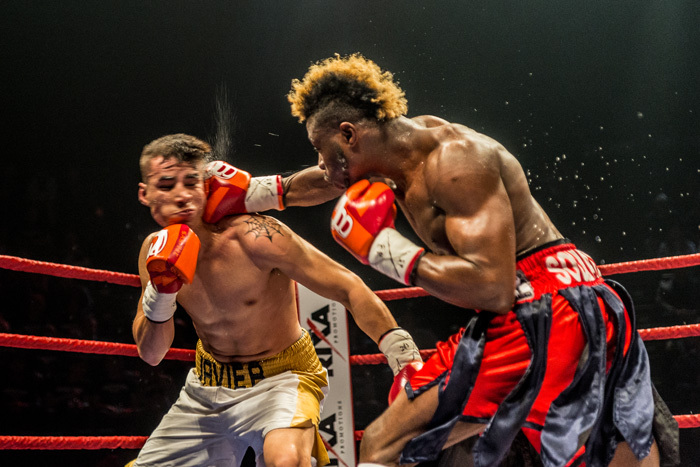 Pierre-Paul kept the match competitive by winning round five with movement and timely punching, but the sixth and seventh belonged to Laguna and it appeared to be his fight to lose. Fittingly, both men let it all hang out in an action-packed final round before the judges scored the second draw of the night, a result which Pierre-Paul should be grateful for as Laguna, in this scribe’s opinion, appeared to get the better of the contest with his straighter and sharper shots. Finally it was time for the main event, a classic match-up between youth and experience as 25-year-old prospect Jordan “Django” Balmir took on local favourite Frank “Hit Man” Cotroni (note the subtle Montreal underworld reference of the older fighter’s nickname). 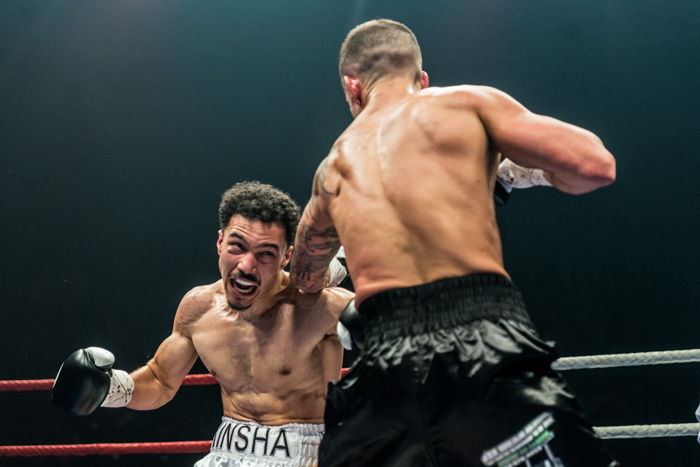 It was a changing-of-the-guard match-up and a Montreal turf war at the same time and both boxers had contingents of enthusiastic fans in the stands. Given all the action that had come before, clearly the two warriors had a great deal to live up to, though at the same time it was unfair to expect yet another punch-packed battle. But while the contest was to some extent marred by excessive clinching and mauling on the part of Balmir, not to mention some illegal use of the cranium, the bottom line is it was yet another fun fight with plenty of back and forth action. The bout’s opening round was tightly contested but following that the match became a highly physical affair with the naturally bigger Balmir using his greater weight and strength to control matters. He tied Cotroni up whenever he pleased and pushed him around the ring, his tactics aided by the referee’s largely hands-off approach. Cotroni had his moments; he out-worked Balmir in the third, landed a series of solid blows in round seven and, impressively, he appeared to edge the final round with the cleaner shots, but too much of the action consisted of Balmir landing one or two punches and then smothering Cotroni in another bear-hug. It was a grueling and physical battle, the type which the smaller Cotroni couldn’t win and the judges scored accordingly. Balmir catches Cotroni with a right. That said, the fight certainly didn’t lack for action and the crowd was lively throughout with Cotroni’s and Balmir’s fans taking turns yelling and chanting. And while Balmir didn’t exactly impress in victory, this was, more than anything else, an excellent fight to help a young prospect with only nine bouts learn and develop. Cotroni gave a good account of himself and showed that, at the age of 33, he can still compete, but if he chooses to continue his career, he clearly would be better off campaigning at 154. Cotroni held his own against his younger and bigger opponent. In the end Rixa and Grant Brothers are to be congratulated for putting on an outstanding show as Montreal fight fans continue to be spoiled rotten. 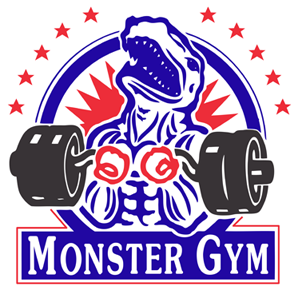 Not only do they have almost weekly fight cards to take in, both pro and amateur, but so often they are treated to contests defined first and foremost by high-intensity action. But last night’s slugfests were made more noteworthy by the fact several of them were legitimate “turf wars” between natural rivals, the kind of matches which inspire only greater fan interest and longer line-ups at the theatre doors. Not to mention full parking lots.